Right out of the shoot, I have some questions about a guitar I got at a neighbors garage sale, it was a free! does have a very tight top crack of about and 1" to 11/4" long and easy repair. up the crack. But setting the neck is where I would have to have the work done and I dont know value of the guitar. basement of the house when the got the house and that was more than 35 years ago. So it has some time to age. Thank you very much for listening to my story and any info would be helpful. Since you can likely get a 70's Troubadour on Reverb or Ebay in good condition for a few hundred bucks, you might look into that option for comparison. The Epiphone model you are talking about is from the 1970s so was built in Japan even if the label says "Made in Kalamazoo." At the time Gibson pretty much licensed out the Epiphone name but had nothing to do with the design or building of the instruments. So these guitars are pretty much re-badged Arias. I believe this model did not have a bolt on neck as some other MIJ models from this era did so I would assume it has a dovetail neck joint. About the only consideration you might end up having to deal with is the cost of a neck reset may be more than what the guitar is worth. Some do not care while others do. I personally do not give a fig. There is a certain satisfaction that comes with getting a guitar back in the condition where it can once again do what it was meant to. 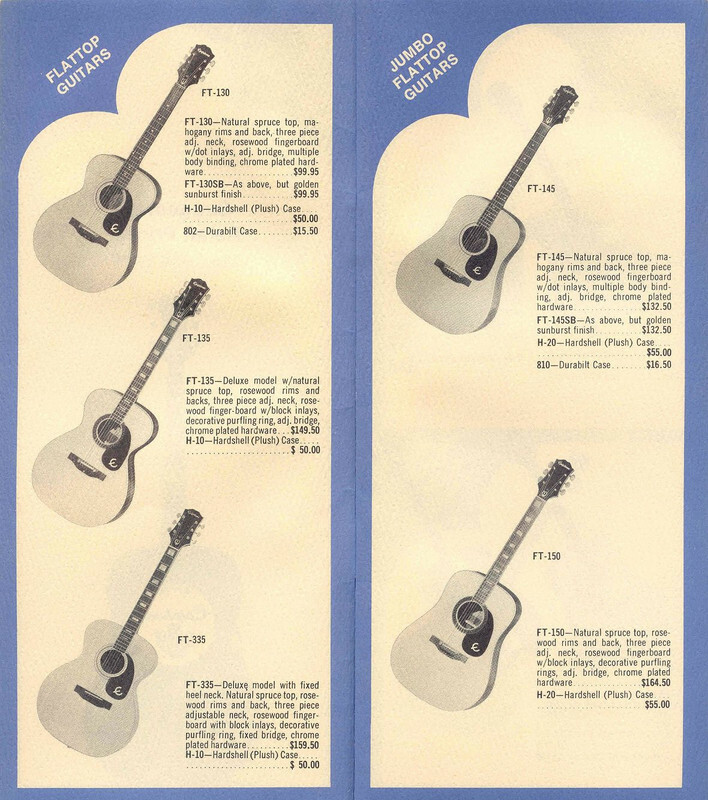 Here is a page from a mid-1960s Epi catalog showing your model. see how it goes, I know what you mean by bring back a guitar value not so important. If I like the sound as much as the few times I played it in the past. And I can sort of of not by to muck, maybe. I just might take a chance with. Thanks again for all input. First, welcome to the forum ratherbwalkn. You'll find a lot of great info here. I actually owned a 335 in the early 70's. It was a really well made guitar. I actually traded a friend for a beat-to-hell J-35 (including cigarette burn on the top). It was my second guitar (my first was a Harmony) and recently I have been nostalgic to get another. I have seen them going for the $250 range. You can get a previously owned Masterbilt for $300-400 and it is by far a superior instrument. How bad is the neck? Can a couple turns on the truss rod and sand the bridge down make it playable?